YOU MUST HAVE ONE! Scroll down to see them all. 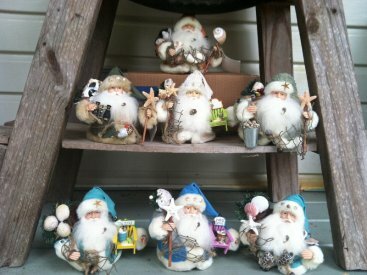 Our 6" Bay Santas are hand-crafted, one-of-a-kind collectibles that are adorned with Chesapeake Bay accents such as regional birds, blue crabs, crab pots, fish, net, sea-horses, starfish, boats, anchors, and much more! They are just smaller versions of our 16" Chesapeake Santas. You will love the detail and personality of each and every one! A precious collectible for yourself or a very special gift for someone special! These guys are Coastal Cute!!! Each Santa may vary slightly from picture. 6" Shell Seeker SOLD OUT! 6" Green Bay Santa SOLD OUT! This is a 6” version of our sold out 2007 Ltd Ed. Santa He carries a sand bucket to enjoy his day at the beach!